Blogging can be a lot like exercising or that pile of clothes on the floor… once I’m too tired to go to the gym or too tired put my clothes away, it’s always just a little bit easier to be too tired the next time comes around. So in that way, I am coming back from something of an unintended hiatus, and I’m not saying I was just too tired to blog for the last few weeks, I was just spending my energies elsewhere and I guess I needed a break. But I’m back! I learned to make homemade enchilada sauce with chipotle peppers in adobo sauce – more on that decliciousness to come. 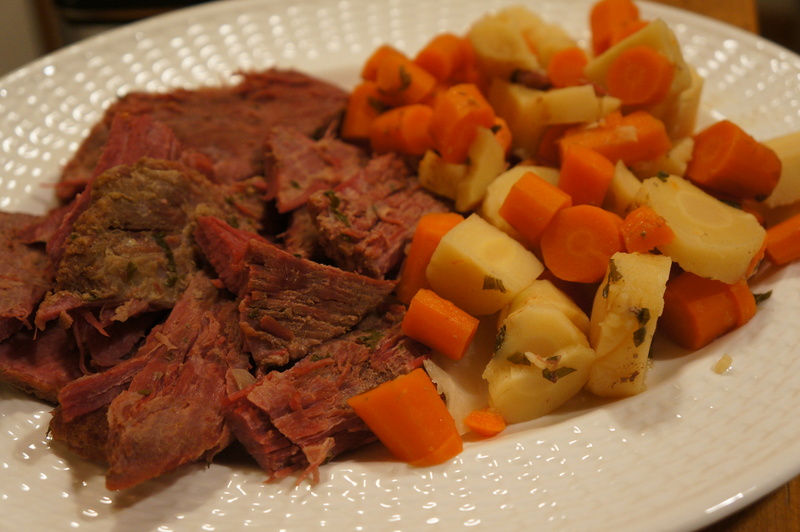 And tried my first St. Patrick’s Day dinner like my mom would make – corned beef and cabbage + carrots, turnips and cauliflower mash (instead of potatoes!). I would say it went pretty well – we didn’t have much leftover but cabbage! And you can only eat so much cabbage anyway. That’s a very brief summary, but I have to save the rest for all the posts I’ve been backlogging in my head… stay tuned and come back!